Whether at rooftop beer gardens or at fireworks extravaganzas and wood-paneled craft breweries, Japanese seem to quaff an awful lot of beer in the summer. Japan’s annual per capita beer consumption fell about 7 percent between 2010 and 2015, according to a study by major beer maker Kirin. The outlook is for more of the same. It’s such an obvious trend that there’s a special phrase to describe it — biiru banare (“leaving beer”) — a gradual decline that hit after beer drinking peaked in about the mid-1990s. Younger Japanese tend to be more independent-minded than their baby boom generation parents or their grandparents, who saw going out for beers with their bosses and co-workers as a call of duty. Brews also are losing out in Japan to a wide variety of other alcoholic beverages, from wine to kanchuhai (fruity cocktails), whisky and cheaper quasi-beers, and of course, sake. Asahi, founded in the late 1800s, is an institution in Tokyo, where its huge golden suds sign shines on the banks of the Sumida River. The annual Sumida River summer fireworks it sponsors each July work like one big huge ad for its beer — this year the capital’s governor, Yuriko Koike, donned a summer kimono for the televised kanpai — traditional toasts — by the river. In its effort to grab attention and help reverse the decline in beer consumption, especially among the younger generation, the iconic brand has turned to Hollywood. It tapped actor Johnny Depp to help sell a limited-edition version of its 30-year-old hit Super Dry — the brew that helped catapult it to No. 1 in the Japanese beer industry in 1998. Its latest ad campaign features Depp riffing on an electric guitar on a rooftop before popping a cold one. Its rivals are also expanding. Sapporo Holdings, which has been the No. 1 Japanese beer maker in the U.S. for three decades, announced this month it was acquiring Anchor Brewing Company. Data compiled by rival Kirin Brewery Co. found the annual global consumption of beer, at nearly 184 million kiloliters, fell in 2015 from the year before, for the first time in 30 years, as consumption in China peaked. By region, Asia still tops the world in beer consumption, making up 34 percent of global guzzling, followed by Europe at 27 percent. North America accounts for 14 percent and Africa just 7 percent, according to the Kirin study. By nationality, Czechs were No. 1 in per capita consumption. Americans ranked No. 20 and Japanese 55th, down from 38th in 2010. “The days of the daily kanpai and chugging beer are over,” said Kirin spokeswoman Naomi Sasaki. At least, though, Japanese are starting to appreciate more nuanced craft beers, she said, reflecting their more individual-oriented lifestyles. For decades, most of Japan’s top breweries routinely churned out new generic brews one after the next, mostly lager. But now Japan has about 200 small craft breweries, giving consumers much more choice, said Hiroyuki Fujiwara, president of the Japan Beer Journalists Association. Fujiwara believes changing tastes in part reflect a change in perspective after the tsunami and nuclear meltdowns in northeastern Japan in 2011. These days, many Japanese are less concerned about keeping up with their neighbors, he said. “The biggest contrast to that kind of thinking is the bubble era, when people simply wanted what was considered cool by society, be it their home or their car,” he said, referring to the go-go economy of the late 1980s, which collapsed in the early 1990s. Last year, Kirin signed a deal with Brooklyn Breweries to replicate its popular flavors at its plants in Japan. Reflecting its flagging sales and the growing popularity of India pale ale, the commercial brewing and marketing giant ironically opened a “craft brewery” in Tokyo’s fashionable Daikanyama district two years ago: Spring Valley Brewery. Asahi recently followed suit by opening one near its head office. The brewery mimics the trend with a Western menu, spacious terrace and beers with names like DayDream and Jazzberry that are brewed behind transparent walls. Shizuka Nagasawa, 29, was enjoying a recent afternoon off at Spring Valley Brewery with her husband, Keita Nagasawa, and their 3-year-old son. They’re such fans they joined the brewery’s club and have craft beer delivered to their home each month. Later that day, in Nihonbashi, an older part of downtown Tokyo, about a dozen salarymen, jackets and ties off, were downing their after-work beers the old-fashioned way. 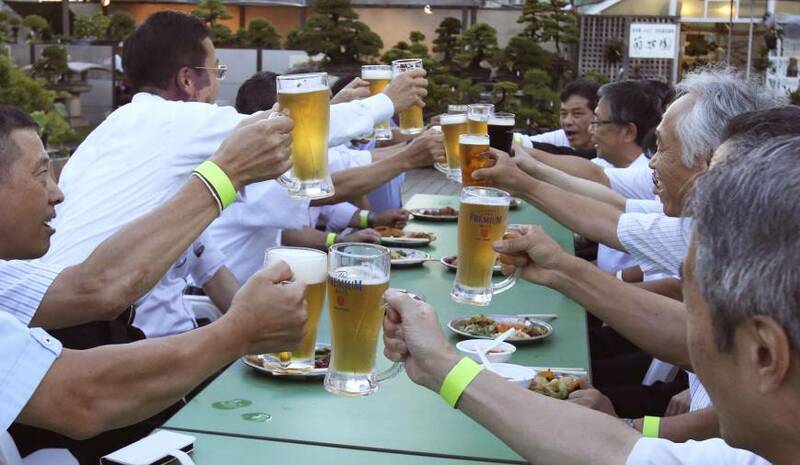 At Mitsukoshi department store’s rooftop beer garden, it was all-you-can-eat-and-drink for three hours at ¥4,801 ($44) for men and ¥4,301 ($40) for women. The food: classics like fried noodles, curry and wieners. The star beer: Asahi Super Dry. Eiji Itou, 50, a technology employee who was sitting beside his president, shrugged at the notion that drinking with co-workers in a beer garden is no longer trendy. 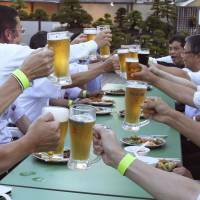 “Kanpai,” the group shouted in unison, raising their beers and gulping them down.